July 29, Jamshedpur (HT): Power dressing would trickle down to the poor people of Jharkhand. Students of XLRI School of Business and Human Resources, in collaboration with Goonj, a New Delhi based NGO, are establishing the first clothes bank in the state. Social Initiative Group for Managerial Assistance (SIGMA), a student body of the premier B-school is making preparations for establishing the bank. Students have decided to provide bare minimum clothes to poor. Members of SIGMA told the Hindustan Times that there are policies for poor people to access food and shelter but it is ironical that there is no policy for providing clothes. "Many poverty ridden people fight with extreme cold, monsoons and heat without clothes. It makes them ill and prone to diseases," students said. Initiative of the XLRI to create a clothes bank also holds significance in the wake of deaths in the state due to cold and heat wave. According to the plans, SIGMA would take care of the technical knowledge for collecting, distributing and tracking of the clothes. It would also see whether clothes reach the poor or not. Goonj has launched clothes banks in many parts of the country. It's the only NGO that took lead in providing clothing to poor masses. 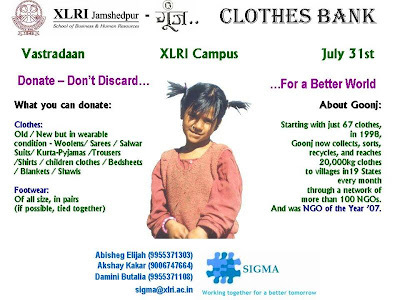 XLRI will partner with local NGOs for distribution of clothes from the bank to the urban and rural poor.... Formal inauguration of the bank will be made in the first week of August. Anshu Gupta, founder of Goonj, and an alumnus of Indian Institute of Mass Communication (IIMC), New Delhi would arrive on the XLRI campus to inaugurate the bank. Students would start clothes collection drive from July 31st.